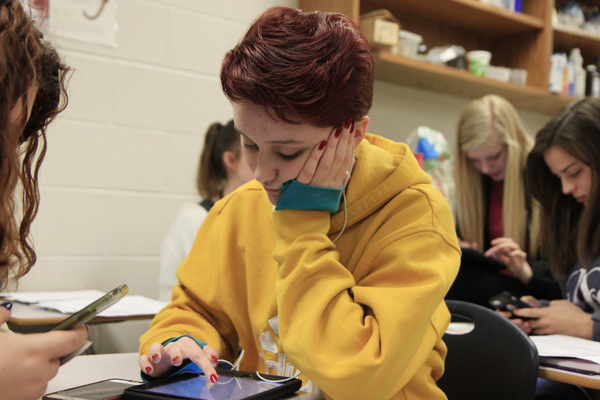 Kaitlyn Skelton, 10, works on her IPad in Mr. Szostek's 2nd period class. Skelton has a severe peanut allergy. A two-year-old Kaitlyn Skelton sits down with a banana and a bowl of peanut butter. As she eats most of it gets on her in the process, and her mother notices that she struggles to breathe. Skelton’s grandmother then examines her, she notices hives cover Skelton’s body. Now a sophomore, Skelton has a severe allergy to peanuts. If she comes into contact with a peanut or a peanut product, the reaction triggers and someone must administer her an EpiPen. An estimated 15 million people in the U.S. have food allergies, with 5.9 million of people under the age of 18. The most common food allergies are nuts, milk, eggs, soy, fish and crustacean shellfish. Senior Solomon Davis also suffers from food allergies to peanuts and tree nuts such as cashews and almonds. He first discovered his allergy after eating a peanut. Allergies can lessen in severity over time and people can eventually outgrow them, and children outgrow allergies more than adults do. Davis used to have a severe allergy to peanuts, but the severity has lessened in the last 3 years. Only about 20% of people outgrow a peanut allergy.